Over the years, NordicTrack has released several 2950 treadmill models. In this post, we’re going to address the NTL 19119 model which was released in the second part of 2018. It’s a commercial-grade machine featuring an advanced console and an automatic incline/decline system. Also, just as the NordicTrack 1750 that we’ve already reviewed here, it includes one year of iFit membership. 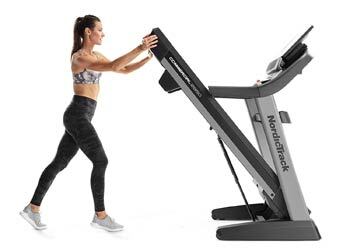 Since it’s a machine designed for functioning in a commercial environment such as a gym club, the NordicTrack 2950 is a fairly large unit. With all the parts assembled, it takes approx. 79″L x 32.6″W (202 x 83 cm) of floor space. Plus, it is recommended to leave at least two feet of clearance on each side, and at least three feet of clearance at the rear for safe operation and ease of access. On the other hand, this treadmill is equipped with the EasyLift assist folding mechanism. Its deck can fold up to save space and to allow you to easily vacuum under it. With the deck folded up, the unit’s length is reduced to approx. half. The folding mechanism uses an automatic hydraulic cylinder which prevents the deck from crashing and breaking when it is lowered. Needless to say, the machine’ structural frame is made of durable steel tubing. Adding the motors and several other parts, its total weight is more than 250 lbs (113 kg). This being said, its assembly and transport require at least two people. However, once the unit is assembled, its relocation can be done with ease. Its front metallic base is equipped with transport wheels. All the steel parts within the treadmill’s frame construction are coated with a chip-resistant and rust-resistant paint finish. However, there also are several ABS parts. Among them, we can count the dashboard that sustains the console, the covers of the side rails, and several other covers. The NordicTrack Commercial 2950 features a heavy-duty deck construction which can support users up to 300 lbs (136 kg). It uses a 2-ply commercial belt which offers a running surface of 60″L x 22″W (152.4 x 56 cm). This should be enough for users up to 6’5″ (196 cm). Of course, taller users should still be able to use the machine but they may not benefit from a full stride when running at full speed. The deck is equipped with precision-machined and balanced non-flex rollers. They’re 2.5″ in diameter which results in better traction and a prolonged lifespan for the belt. They also integrate industrial-grade ball bearings which provide a very smooth rotation. Last but not least, this NordicTrack treadmill is equipped with the Reflex™ cushioning system. The side cushioning elements of the deck are concealed, and the adjustment is done with ease from the dial on the left side of the deck. The dial on the left side offers two modes, one for a firmer running platform, the other with more cushioning at the front to absorb the shock of each footstrike, and harder at the back for a better push-off. 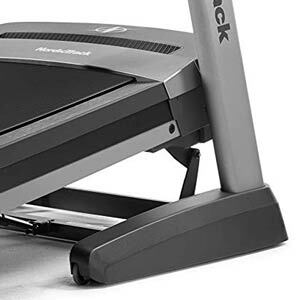 The NordicTrack Commercial 2950 is equipped with a motorized incline and decline system. Its incline range is from 0% to 15%, while its decline range offers three positions, from -3% to 0%. Needless to say, the unit’s incline/decline system is automatic. It consists of a motor and a metallic lift placed under the front of the deck. When selecting an incline setting, the lift will slowly elevate the deck at the front, while if you select a decline setting, the lift will lower the deck at the front under the 0% setting. The incline or decline of the deck can only be adjusted from the console. Also, some of the on-board programs will adjust the incline or decline automatically throughout their duration. The console offers two sets of buttons for incline and decline adjustment. The Up/Down arrow buttons on the left of the lower keypad found on the console allow you to adjust the incline gradually. However, there also are quick selection buttons on the left side of the display for the incline/decline settings ranging from -3 to 15. One important aspect to mention here regards the decline feature. If a decline position is selected for the deck, you won’t be able to select the highest speed settings. Last but not least, the step-up height of the deck is approx. 11″ (28 cm). Plus, with the incline set all the way up, the front part of the deck will become elevated by a few extra inches. Therefore, it is recommended to use the machine in a room with a ceiling that is at least 20″ (51 cm) higher than your own height. The NordicTrack 2950 NTL19119 is equipped with a drive motor similar in power to the one on the ProForm PRO 9000. It’s a commercial-grade 4.25 CHP DurX™ motor. It’s designed to offer maximum performance during the longest workouts, even if the user is close to the maximum 300 lbs (136 kg) weight capacity. It is equipped with an internal cooling system. It also has a side flywheel to neutralize vibration and deliver a very smooth motion for the running belt. This NordicTrack treadmill offers a speed range between 0.5 MPH and 12 MPH. Just as for the incline, there are gradual adjustment keys on the lower console keypad and the quick selection keys on the right side of the console display. The gradual selection keys have a double function. A short press will adjust the speed in increments of 0.1 MPH, while if you press and hold them, the speed will adjust in 0.5 MPH increments. The motor itself is fairly quiet. But just as for any other treadmill, your running cadence will generate some noise. Differently put, in an apartment building, your neighbors will definitely hear you running. Last but not least, the treadmill requires a standard 120V circuit. It comes with a standard power cord for American-type outlets, not an AC adapter. The connector for it is situated at the front of the deck, next to the On/Off switch. 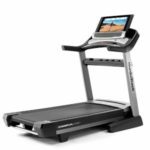 As opposed to the older 2950 treadmill versions, the NordicTrack Commercial 2950 NTL19119 features a console with an ultra large, 22″ HD LCD display. Its interface uses smart touchscreen technology. As opposed to the older versions, this one has an HDMI port along with the USB port, so you can connect it to a TV or monitor in order to view the console screen on a larger display if you want. It is also angle-adjustable. 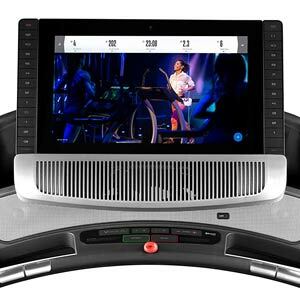 The console display tracks all the important workout metrics, such as elapsed time, distance, speed, average speed, pace, calories/hour, total calories burned, incline & decline, and heart rate. Speed and distance can be set either to imperial units (MPH, miles) or metric units (km/h, km). Plus, there is a function for the distance which shows it as a 1/4 mile (400 m) race track keeping count of the laps that you have completed. The unit’s console is compatible with all Bluetooth HR transmitters. However, an HR strap is not included. So, if you do not opt for one, you can only benefit from a pulse reading by holding on to the sensors integrated into the front bar of the machine. 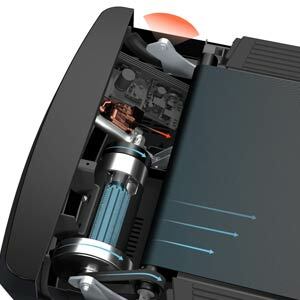 Apart from the Bluetooth connectivity, the machine’s console can also connect to a Wi-Fi hotspot so that you can connect to your iFit account. As we’ve mentioned above, the machine includes one year of iFit membership. The iFit application gives you the possibility to choose from 16,000 on-demand workouts, run on virtual trails based on real-world locations, and benefit from live interactive training. You can also draw your own map workout, setting up the distance, the average amount of calories that you would like to burn, and more. Leaving iFit aside, the console unit has 50 workout programs built-in its database. They cover all types of workouts focusing on weight loss, high-intensity cardio, intervals, stamina development and much more. Therefore, if one year passes and you decide to not renew your iFit membership, the machine still has you covered with a wide variety of workout programs. In terms of other features, the console is also equipped with a sound system, a set of cooling fans, and two device holders. The sound system consists of two 3″ speakers. It is compatible with any smartphone or MP3 player so you can play your music through the integrated speakers for a better sound quality. The fans are fairly large, so the unit does provide a pretty decent cooling if needed. And finally, there are two side trays for keeping your water bottles or other accessories, plus another tray under the console, connecting the two front masts. The machine’s deck with its motors, cushioning system and folding mechanism is already assembled. All you have to do is connect the two front bars, and then the console. This shouldn’t take more than an hour. The manual provides clear, step-by-step assembly instructions, and all the necessary tools are included. The unit’s deck comes pre-lubricated so it shouldn’t need any lubrication for a long period of usage. The running belt should be kept clean, free of dirt, textile fibers or other objects that might be dragged under it and get caught in the motor. Also, it is recommended to periodically inspect the machine for loose bolts and parts. 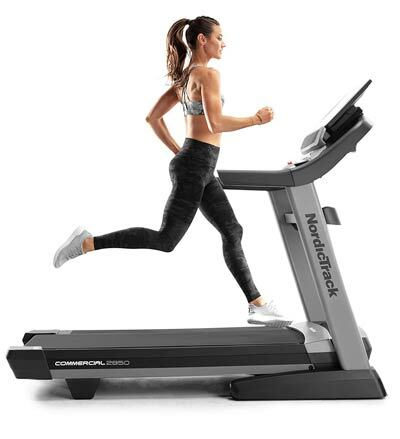 The NordicTrack Commercial 2950 NTL19119 is a heavy-duty treadmill equipped with a 4.25 CHP DurX™ motor, a motorized incline & decline system, and an advanced console with Wi-Fi and Bluetooth connectivity, featuring a 22″ HD display. The machine is iFit compatible and includes a 1-year iFit membership. It also has an internal database of 50 workout programs. It’s definitely a versatile treadmill, great for users of all levels.